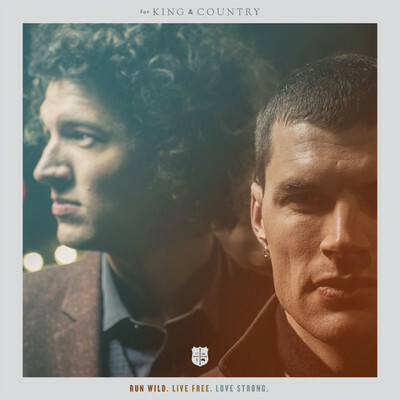 Louder Than The Music - for King & Country - Run Wild. Live Free. Love Strong. I’ve been following For King & Country for a few years now. It’s been great watching them undergo the teething process of breaking into Christian music. They were always becoming. They toured with their sister, developed into Joel and Luke, and finally arrived: For King & Country. With this album 'Run Wild,Live Free.Love Strong' they’ve really settled into their identity as artists. Read More I’ve been following For King & Country for a few years now. It’s been great watching them undergo the teething process of breaking into Christian music. They were always becoming. They toured with their sister, developed into Joel and Luke, and finally arrived: For King & Country. With this album 'Run Wild,Live Free.Love Strong' they’ve really settled into their identity as artists. A couple of years ago, I sat down with Joel and Luke to talk music. Something unique about them was the diversity of topics that they wrote about, and at that point, they had written over 130 songs that they needed to narrow down for albums. They’re incredible writers, and talents translates well into this album. “Are these walls to keep you in or to keep others away?” The album opens with this question - a question that holds the heart of this album. It’s wrapped into the sound, and it puts you on the edge of your seat, waiting for something to happen. “Don’t you want to run wild? Live free? Love strong?” On the first track, Anthony Mineo answers with a resounding YES. And the next tracks can convince you of why. Next, “Fix My Eyes” is just one example of of the creativity behind FK&C’s use of percussion. This catchy song doesn’t just make you want to feel good or even to feel God. It’s says do what’s right, no matter how it feels. Then, "To The Dreamers" has the same type of motivation. It presents a plea to those who are on their way, those who are still becoming. It sounds like it could be influenced by Imagine Dragons. The next two songs, “Shoulders” and “No Turning Back” are two of their more explicitly Christian songs. “Shoulders” sounds like (and is) a hit on Christian radio. That said, both songs have the FK&C strings, complexities, and percussion that gently work their way into the songs. At the end of “No Turning Back,” the song transforms into a familiar melody. “Without You” is absolutely heart wrenching. It’s very sweet: bittersweet. There’s this overwhelming sense of sadness about it. You feel this wave of a loss on the horizon, but it hasn’t broken yet. “Let’s dance a little, laugh a little, and hope a little more.” It features Courtney, who has a lovely voice to match Luke’s. After that, the next set of songs brings the mood back up. The first tune, “Love Live,” is an anthem to “the young at heart” and the “soul set free.” It states,“with two left feet, keep on dancing.” This song will hit home with anyone who loves in a big way. Then, “Steady” speaks directly to God. It matches “Shoulders” very well. Following “Steady,” “Already Home” brings in new, more electronic sounds. If you know the words “oh, oh, ah, ah, ah” then you can sing along! Although this song didn’t seem as tight as the rest of the album, it has a lovely message. The penultimate song of this album strips away all the fancy bits and shows the heart of the album. This is a plea for a God’s love. The sound of an organ takes me back to church. The guys talk about the rawest and dirtiest parts of us, which opposes the idea of the love freely given to us. When the music fades, they speak. This part is important to the album as it really sums it up in the most artistic, simplistic, and beautiful form. The last song says “look how far we’ve come….” It’s telling us to take what this album teaches and actually apply it. The album ends telling us to put down our headphones but carry the music with us. We can take this music with us and impact the world in such a big way.